A few rock-solid dividend stocks to add to your watch list. There are significant benefits to including a few dividend-paying stocks in your portfolio. Not only can they produce steadier returns with lower stock price volatility, but their payments help investors take advantage of market swings simply through automatic reinvestment plans. Then, as retirement approaches and income becomes a bigger priority, you can easily start taking dividends in cash, rather than directing them toward automatic stock purchases. Here are a few companies that pay substantial dividends and boast a solid track record of raising that payout over time. Below, I'll highlight some reasons to consider adding a few of them to your portfolio. Data source: Company financial filings and YCharts. For consistency, it doesn't get much better than Johnson & Johnson (NYSE:JNJ). The medical and pharmaceutical conglomerate has raised its dividend for 54 consecutive years -- one of the longest such streaks on the stock market. Its massive scale in a consistently growing healthcare market has helped shares rise by a nearly 11% compound rate since 1985. Its 70% gross profit margin, meanwhile, not only beats other dividend payers on the above list but also outpaces more directly comparable companies, like Procter & Gamble and 3M. 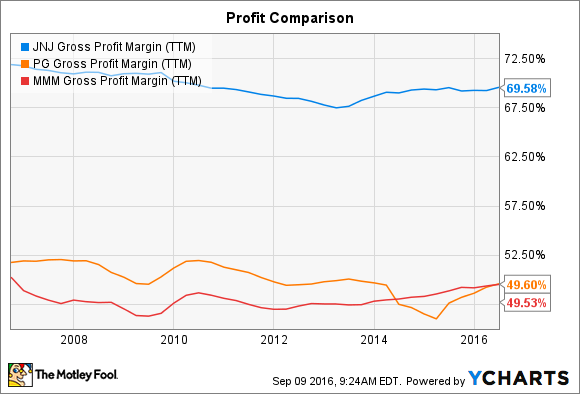 JNJ Gross Profit Margin (TTM) data by YCharts. Johnson & Johnson is growing faster than these industry giants, as well, which is a testament to its unusually strong competitive position. At 22 times last year's earnings, this stock isn't particularly cheap. Yet the company has consistently demonstrated why it deserves a premium valuation. If it's fast growth that you're after, then consider Home Depot (NYSE:HD). The home improvement giant's profits are on a multi-year upswing, thanks to a rising housing market that has plenty of room to continue climbing. Annual net income soared from below $4 billion in 2012 to over $7 billion last year. LOW Net Income (TTM) data by YCharts. Home Depot targets returning 50% of those profits to shareholders in the form of dividends every year, which explains why the payout has skyrocketed lately. That's a more aggressive goal than rival Lowe's and its 35% payout promise. 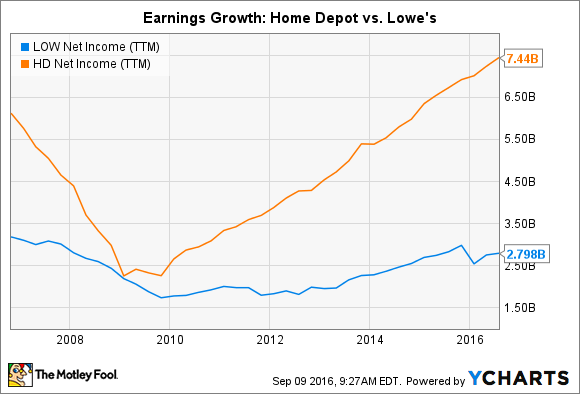 Dividends aren't the only area where Home Depot beats its smaller competitor: Sales growth, profit margins, and capital efficiency metrics all point toward Home Depot as the stronger stock purchase right now. Finally, Yum! Brands (NYSE:YUM), the owner of KFC, Pizza Hut, and Taco Bell restaurants, looks attractive right now for two big reasons. First, its operating results are strong. Earnings are up 30% over the last six months, thanks to rising restaurant-level margins and an aggressively expanding store base. Sure, comparable-store sales growth is slowing, but that is an industrywide issue and one that Yum!, with its diverse set of fast-food offerings, should be able to weather better than rivals. Second, the restaurant chain is on the cusp of shedding its China KFC business, which will free management to focus its energies on improving market share in the U.S. The spinoff will also produce plenty of capital -- much of which Yum! plans to return to investors through stock buybacks and dividend increases. Each of these investments carries specific risks that could cause the stock to underperform in the future. Dividends don't change that basic truth. Yet by focusing on dividend payers, investors enjoy tangible returns in exchange for their patience, which makes it easier to stomach volatility on the way to -- ideally -- market-beating long-term stock price appreciation.